Why is Ecopropi’s heat recovery ventilation system so popular? When people breathe, they fill their environment with carbon-dioxide and water vapour. Also, by cooking, washing, showering, etc. we produce even more vapour, which results in humid air, as the moisture cannot escape through the good, nearly air-tight doors and windows. This supports the occurence of mould infection. Frequent ventilation could help to improve the condition of the air, however during the heating period it causes great heat loss. By letting fresh air in our homes (and letting the heat escape), we waste a great deal of money at the same time. It is highly recommended to plan the installation of a heat recovery ventilation system along with your scheduled building refurbishment in order to minimise the costs of necessary demolition and labour. This way we can make sure, we get the best value for our money. 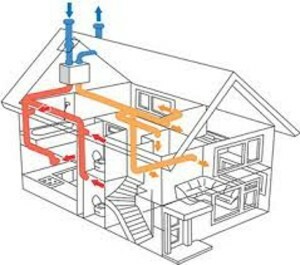 A modern heat recovery ventilation system provides fresh air in the house and it does not consume more power than a smaller light bulb (i.e 15-20 Watt). We already established that when we exchange the air in the house (extracting used, warm air from inside, and replacing it with fresh cold air) we would end up with a great heat loss. However, the installed heat recovery ventilation system will use the heat of the outgoing air to warm up the fresh air intake. Another advantage of this system is that it is never draughty in the house during summer, the ventilator slowly and steadily exchanges the air. All doubts that it is loud or non-hygenic need to be dissolved at once. We developed a sound-proof system with easy to change filter elements. We can also provide periodic check-ups upon request (annual check-up is sufficient). By using such a system, the reduction in energy consumption could reach up to 50%.